Chairman of the Lev HaOlam organization says he cannot stay silent in the face of motion to declare BDS free speech. 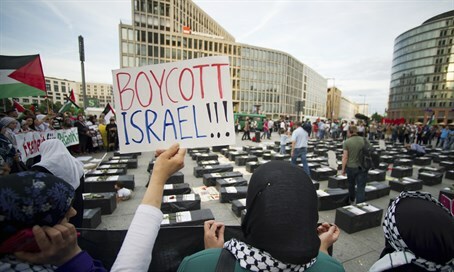 The Dutch parliament met Thursday to discuss the Boycott, Divestment, and Sanctions (BDS) movement against Jews in Judea and Samaria, where they controversially declared the damaging movement as protected by free speech. Arutz Sheva discussed the development with Attorney Nati Rom, head of the Lev Haolam organization that fights BDS by selling goods from small businesses in Judea-Samaria directly to customers worldwide. Rom distributed products from Judea-Samaria to the parliamentarians ahead of the ruling, and organized a counter-protest which he said drew a lot of supporters. "We are here to stay that we are taking a stand for Israel and we will not be silent anymore," he added. "After what happened in Europe seventy years ago, we will not be silent when we see that they label Jewish products."